Progress on the relief well at the Deepwater Horizon well has now reached the point that BP have started the procedures for the top static kill of the well. There was a little delay in the installation of the casing for the relief well because, during the time that the well had been left untended during the last storm, the sides sloughed a little, and about 40 ft of debris accumulated in the bottom of the well. This was obviously more than had been expected, since the clearing run to remove this and condition the well took longer than originally planned. However that clean-up operation is now complete and the next step in the process, the initial flow testing of the original, now sealed, well to see how it behaves as fluid is injected, is now starting. I am going to review some of the comments made both by Admiral Allen, and earlier by Kent Wells about the procedures that are now starting. I will also try and expand a little on the determination of what is happening as the oil, and then mud, are injected into the well. 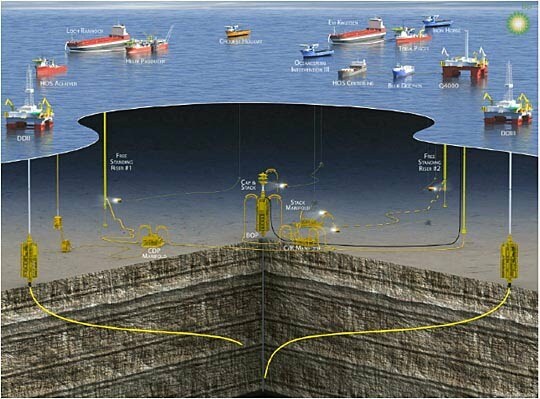 There are still a significant number of vessels around the wellheads of the three wells out in the Gulf. However the ones that are critical for the next phase of the operation are the Hos Centerline, the Blue Dolphin and the Q4000. However, in the best of circumstances the Hos won’t be needed, since it is largely there to provide a large quantity of mud, if necessary. The hope, however, is that it will not be needed. It should take less than 2,000 barrels of mud to fill the well, and the Blue Dolphin has more than 8,000 barrels on board, so the Hos is more in the nature of insurance. Not, however, that the first stage of the process will use mud, instead it will inject oil back into the well. we had to remove all the gas out of the Q4000 riser pipe. We had to pressure-test the Horizon blowout preventer, critical in this process. We had to rig down the Q4000 production line to bring the hydrocarbons up and actually rig up for pumping operations that would allow us to put both oil and pumping mud back down. Part of that involved making sure the yellow pod controls, which control the valves on the subsea portion of this work, that all the valves and the flanges have been tested to proper pressure ranges and that the pressure gauges that we're going to be looking at, they're going to be very, very important as we move forward, are all tested, calibrated and operating properly, and to make sure that we have backup and duality of measuring pressure. There was a small leak in one valve, that had to be corrected on Monday, and the process is ready for the first phase of the test. 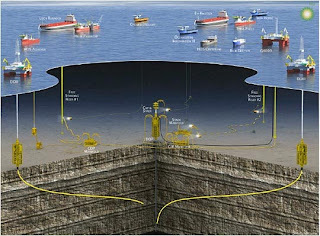 Both phases will feed fluid into the well through the kill line on the BOP, it is one of the purposes that the line serves in a conventional well. The fluid will initially be oil, and will be pumped very slowly (a barrel a minute) into the well. At this point, since the well has shown itself to be in good shape, apart from where the oil has been leaking into the well, the test has a simple goal. 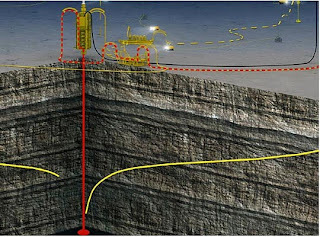 If the only exit from the well that is now open is the rock through which oil and gas were flowing into the well before the well was capped, then injecting oil into the well at the top, should force an equivalent volume of oil at the bottom of the well back into the rock. The first test will therefore first find out if oil can be pushed back into the rock. By starting at a relatively slow flow rate the flow should start with very little additional pressure applied to the well (the science team have put a cap of 8,000 psi on the pressure that will be allowed in the well). After running for a short while at the slowest flow rate, the rate will be increased first to two barrels a minute and then to three. The result should show that with little change in pressure, that the oil added is causing an equivalent outflow at the bottom of the well, and should (by looking at the pressure required for the flow rate) help determine how fast the well can be filled with mud (since the oil it is displacing has to flow back into the rock). The well flow will be kept slow for several reasons. One is that higher flows require higher pressures, and there is the bound that has been set; the second is that higher flow rates down the well will generate some frictional force that the fluid will also have to overcome as it moves down the well. Too high a value for the friction – which is additive to the driving pressure – and the well starts to approach the limiting pressure allowed for the exercise. There is a third objective to the tests, but it is one that will be probably easier determined when the fluid is changed to mud. If the well had been completed properly then its structure would have an outside liner made up of a steel casing surrounded by cement, then there is a gap or annulus, then there is a central steel tube, known as the production casing, that is supposedly cemented firmly in place at the bottom of the well. 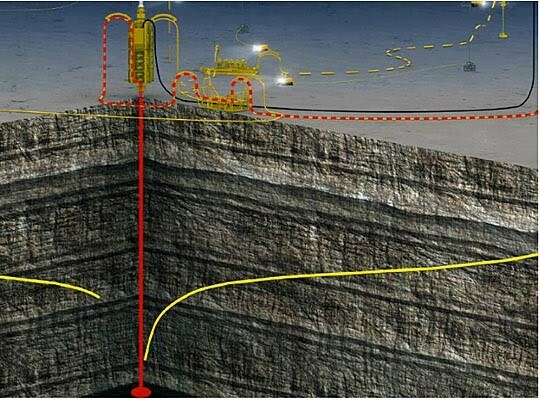 The well has a leak at the bottom which is feeding oil either into the annulus, into the production casing or both. By adding fluid at the top of the well, and seeing how the pressure changes as larger volumes of fluid are added, particularly with the mud injection, the changing pressure should show which column(s) are taking the mud, because the oil is flowing out of them back into the rock at the bottom of the well, and which are not. As the mud injection continues the change in pressure (since the mud exerts weight on the bottom of the well it will lower the pressure needed for injection at the top) with inflow should tell the monitoring engineers, for the amount of mud injected, how long (roughly) the mud column is in the well. Knowing the relative cross-sectional areas of the annulus and the production casing, and the volume injected, this will allow the engineers to then know down which column the mud is displacing oil back into the formation. And since it can only do this if there is the leak at the bottom (since the cement should have sealed both), this information will be very helpful in telling those running the relief well what to expect when that well runs into the original one. What there should be is a slow pressure decline, and that would tell them that they're slowing overcoming the pressure of the hydrocarbons with the weight of the mud moving forward. That decline will be less with the amount of volume if it's in the entire annulus, so about five or six hours into this, the pressure readings are going to be very, very significant on whether they know they're filling the pipe, the casing, or the annulus moving forward. At that point, once they have ascertained exactly what it is they're doing, they will finish putting the mud in. The fourth step, if it is decided, would be whether or not to put cement in. That would be done based on the results of the test and whether or not the mud is required to fill both – fill the drill pipe, the casing and the annulus. Given that the evidence from the experience with the relief well is that the sides of the wells can slough into the well and that the annulus that the relief well is drilling into was left partially open so that it could have sloughed down onto the original cement, making it difficult to possibly ensure a good seal in that area, I am not sure that the cement injection would work well from the top, and might be better left to the relief well. They think it's going to take about four hours to evaluate the data from the injectivity test, in other words, to understand exactly what the pressure means, what the pump rates are, and what the maximum pressure that was measured in the capping stack. It could be less, but they're assuming four hours. And then they're looking at about another five hours to do the initial pumping, start pumping mud in at two barrels per minute. That will start getting them to a threshold where they should be able to start – they have these curves on whether or not it's the annulus and the casing or just the annulus or just the casing and how the pressure should perform and decline. So as they pump those two barrels per minute in over the next first five or six hours, they're going to try and discriminate exactly which pressure line they're on that would tell them they've got an issue with the annulus or the casing or both. That entire period will take about five hours, so you're four plus five. Then, depending on – once they understand that, whether you have to fill the entire casing and the annulus (up and it splits), it could either be on the low side, take you about 33 hours to complete it, or as much as 61, if they have to pump enough mud and it would fill both the casing and the annulus. It kind of diverges at that point. The next 24-hours should therefore be very productive, especially since BP has promised to keep us informed of the progress. Once the initial results are in, it is then intended to keep adding mud until the pressure at the top of the well falls to zero, meaning that the driving pressure of the reservoir has been balanced by the weight of the overlying mud. That will be the operation that will take the 33 to 61 hours.